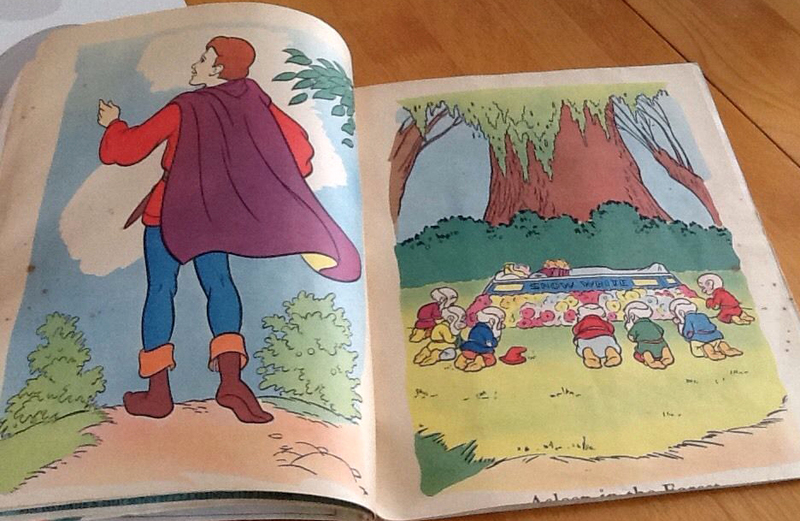 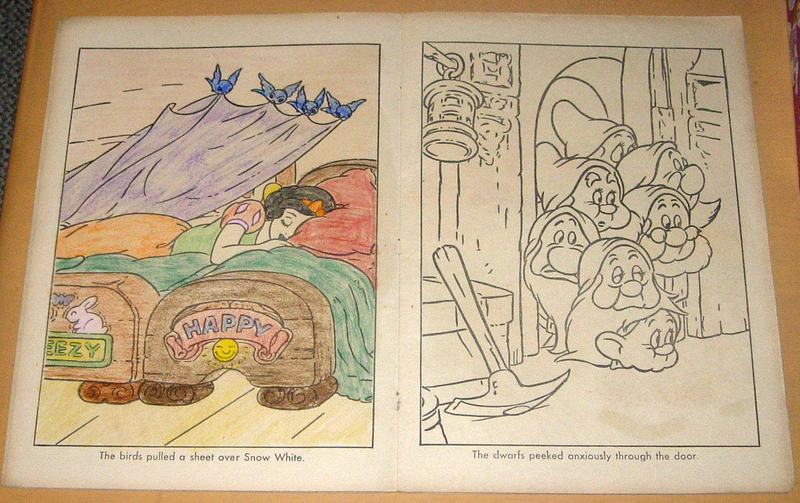 Snow White and the Seven Dwarfs Coloring Book, no. 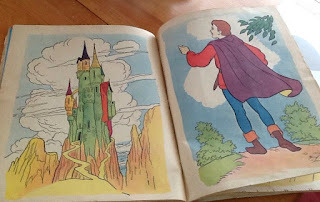 1093. 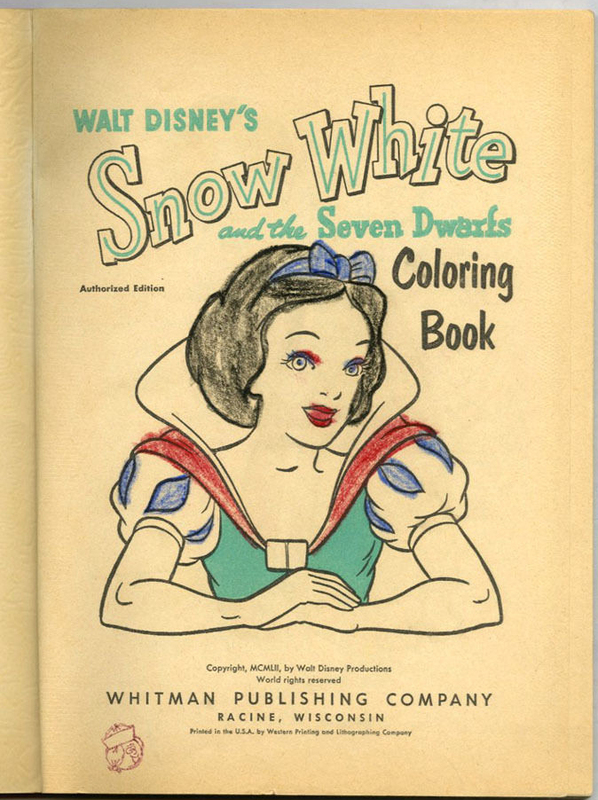 Produced by Whitman Publishing Company, 1952 reprint. 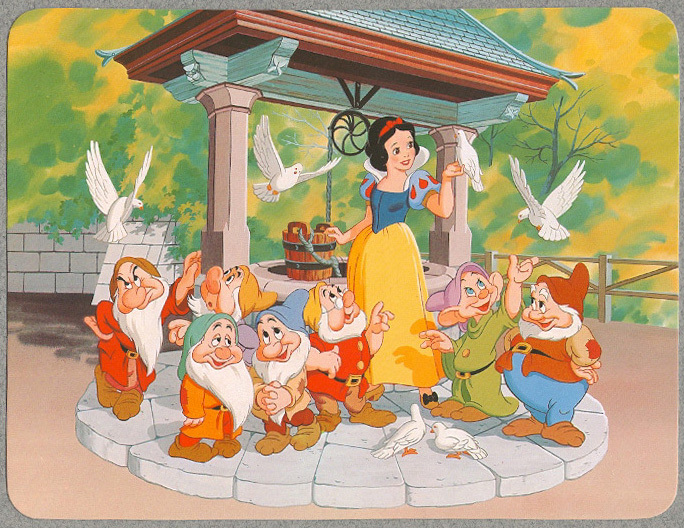 "© Walt Disney Productions." 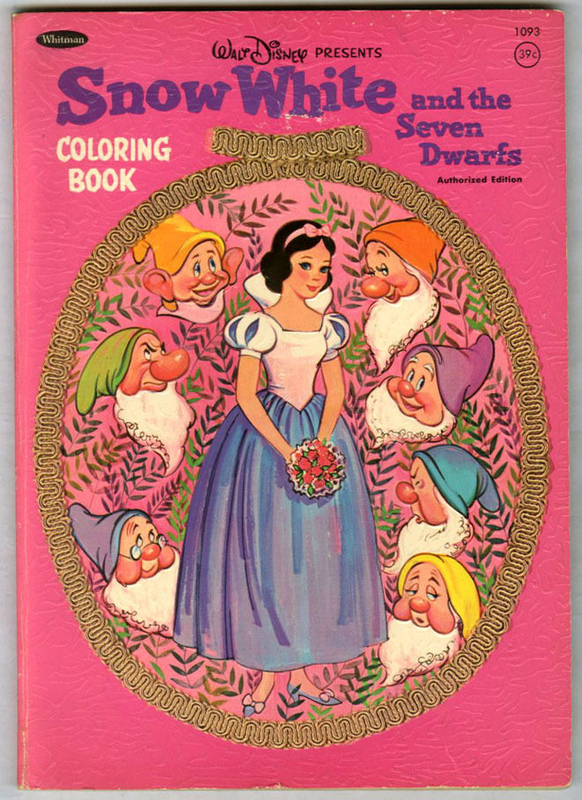 The Authorized Edition features a pink cover with raised embossed texture. 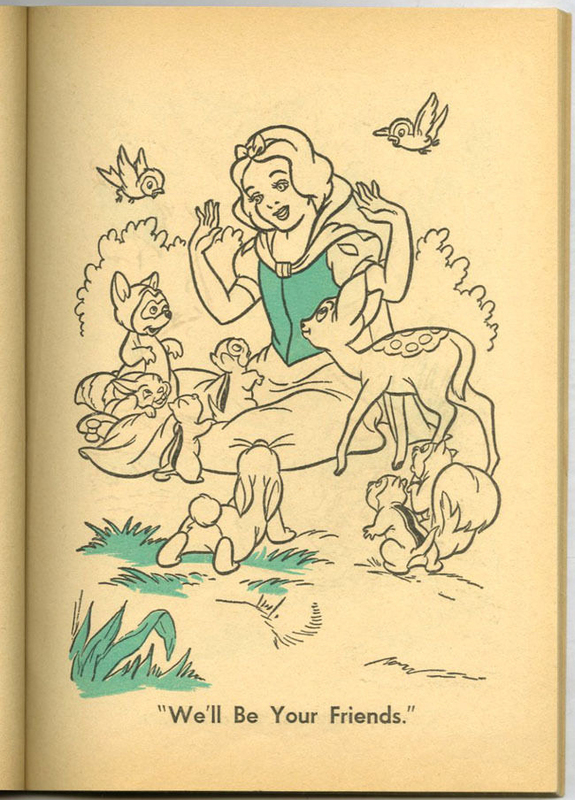 Illustrations include green highlights. Dimensions: 11" high x 8" wide. 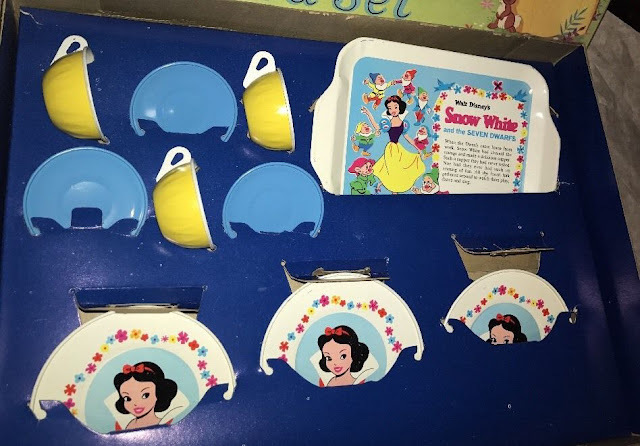 Original retail price 39¢. 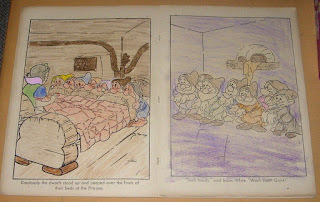 Illustrations and text copyright Walt Disney Productions/Western 1952. 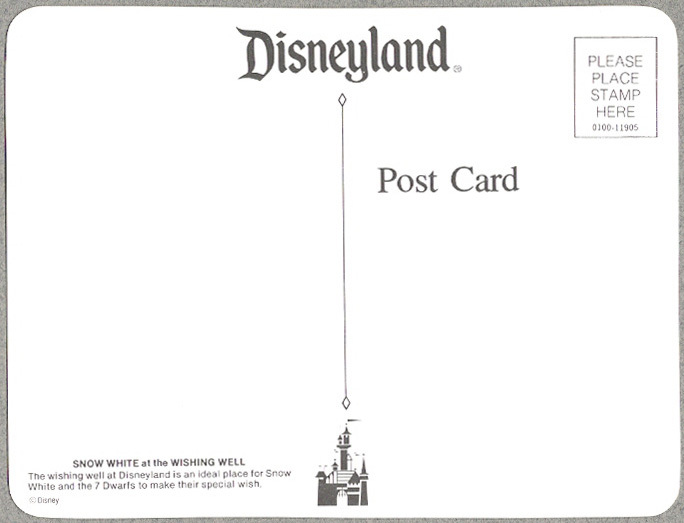 Posted here for historical documentation purposes only. 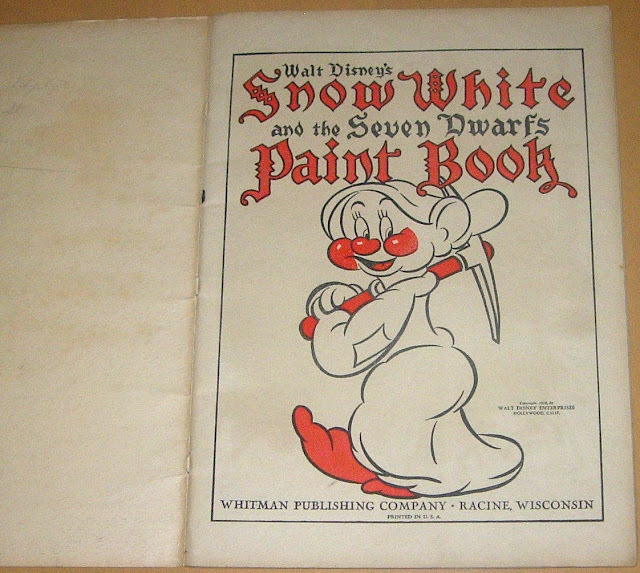 A regular edition was of this book was also issued. It had a blue cover and lacks the green page highlights. 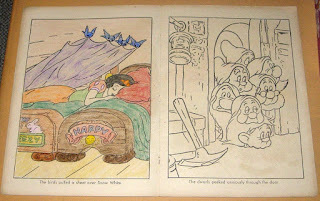 Snow White and the Seven Dwarfs Coloring Book. A Whitman book, no. 1052. 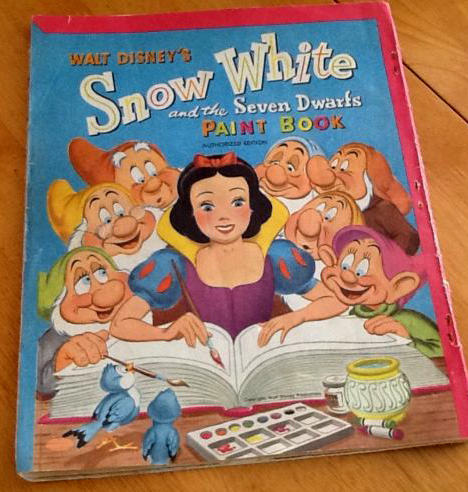 Produced by Western Publishing Company, 1952 reprint. "© Walt Disney Productions." 80 pages. 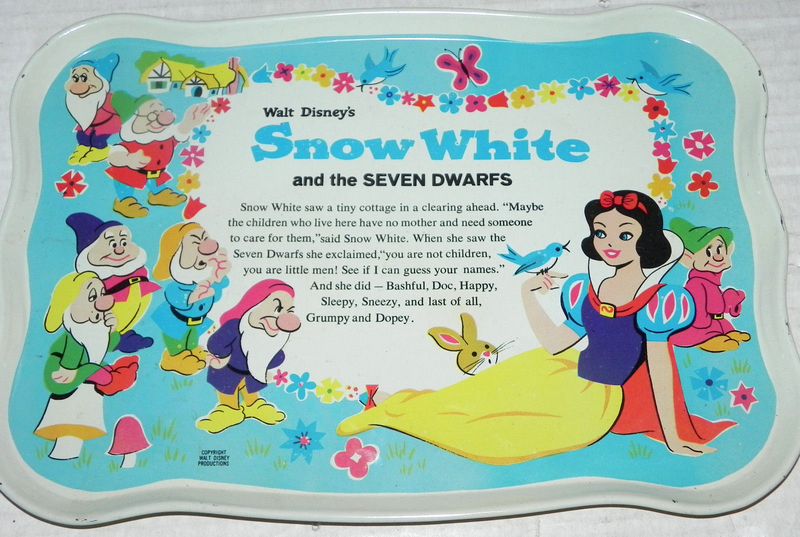 Dimensions: 11" high x 8" wide. 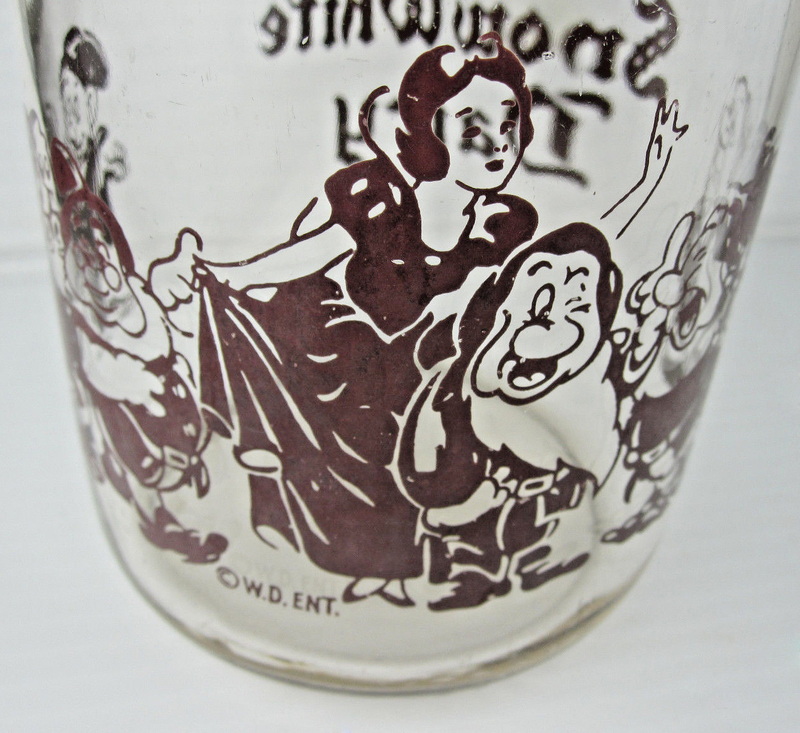 Original retail price 39¢. 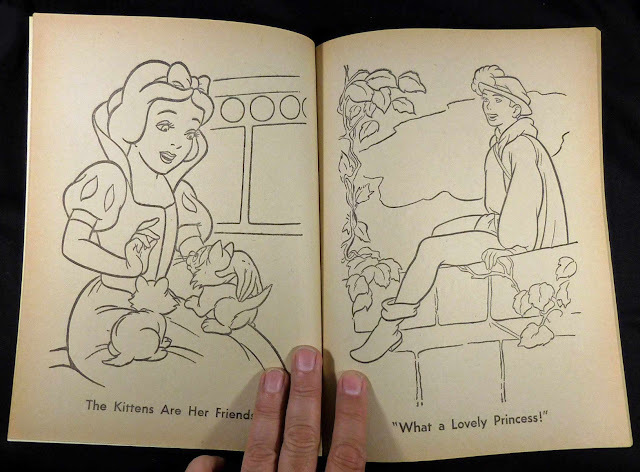 Both a regular and "Authorized Edition" were produced. 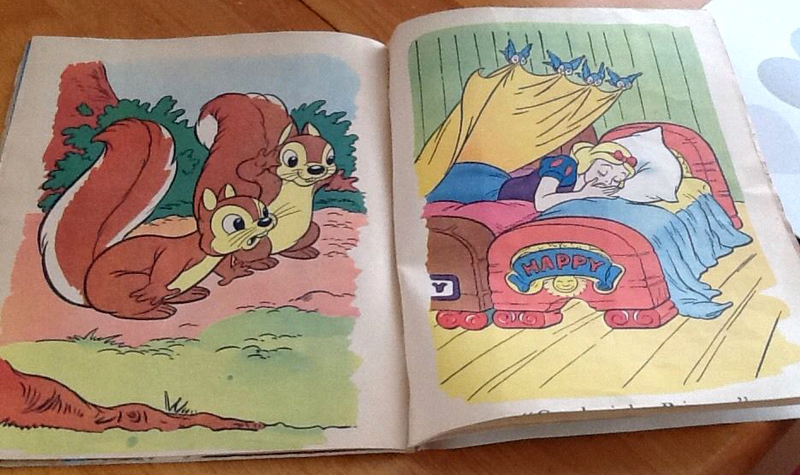 The latter featured the same images partially filled in with green highlights. The price was raised to 49¢ in a later printing. 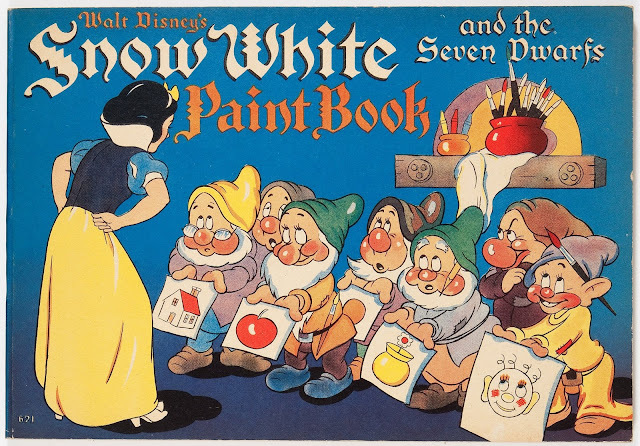 Snow White and the Seven Dwarfs Paint Book, no. 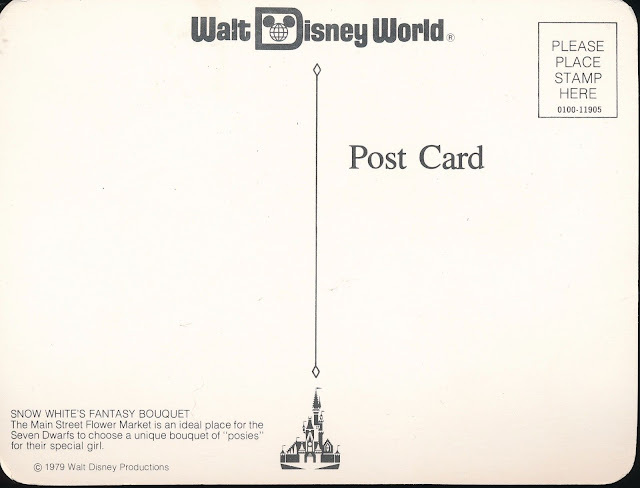 678:10. 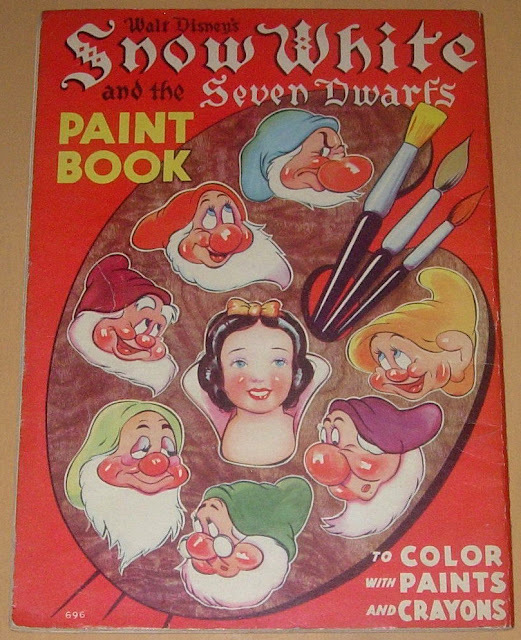 Produced by Whitman Publishing Company, 1952. 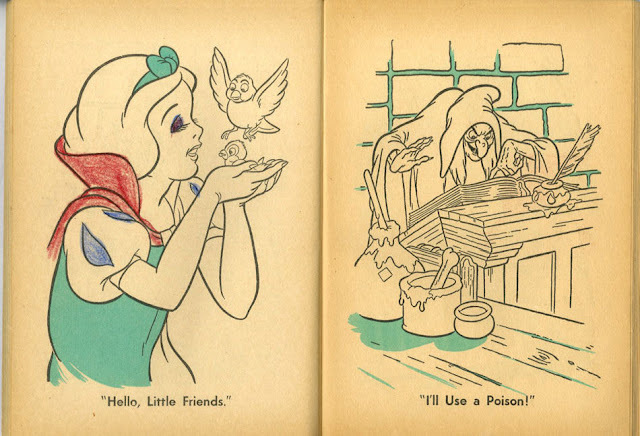 "© Walt Disney Productions." Dimensions: 11" high x 8" wide. 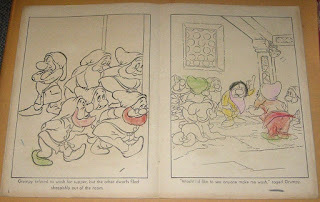 The same illustration is pictured on the front and back cover. 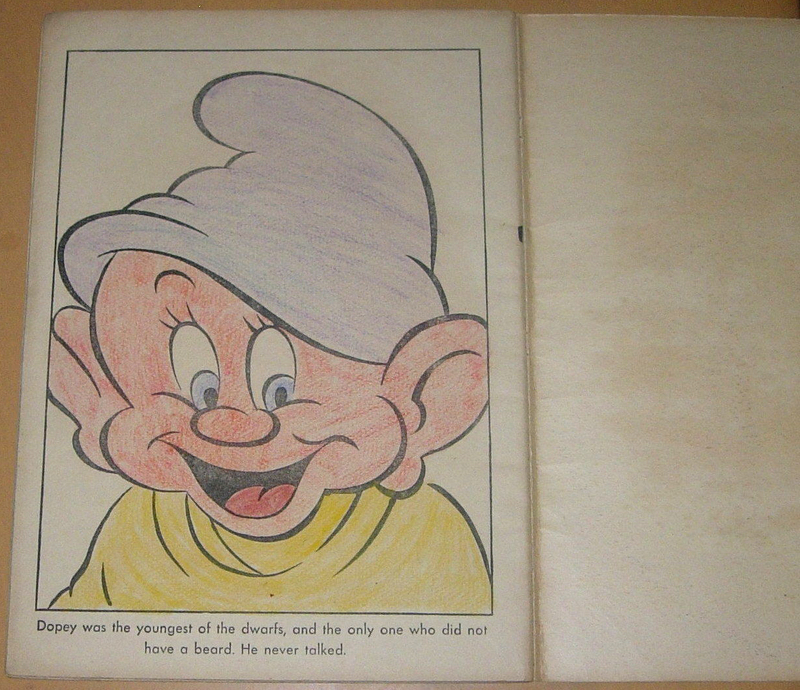 The Whitman "Authorized Edition" featured images partially filled in with red highlights. Other editions have been seen without the red coloring. 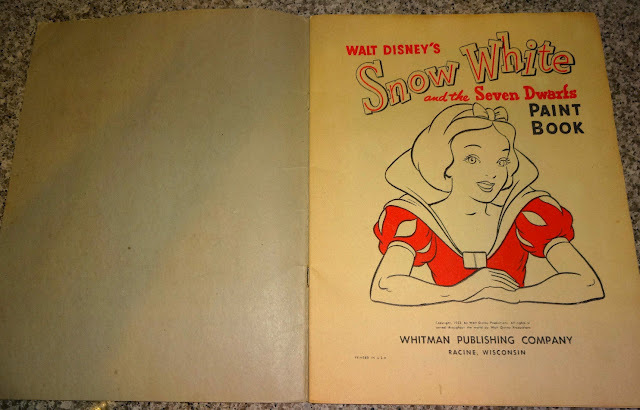 Illustrations and text copyright Walt Disney Productions/Whitman 1952. Posted here for historical documentation purposes only. 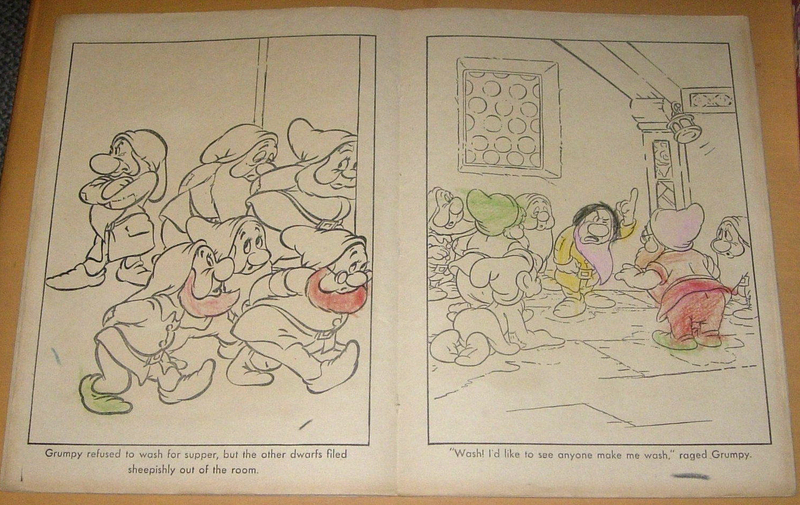 A rather unusual copy of this coloring book was seen for sale on the UK ebay site. 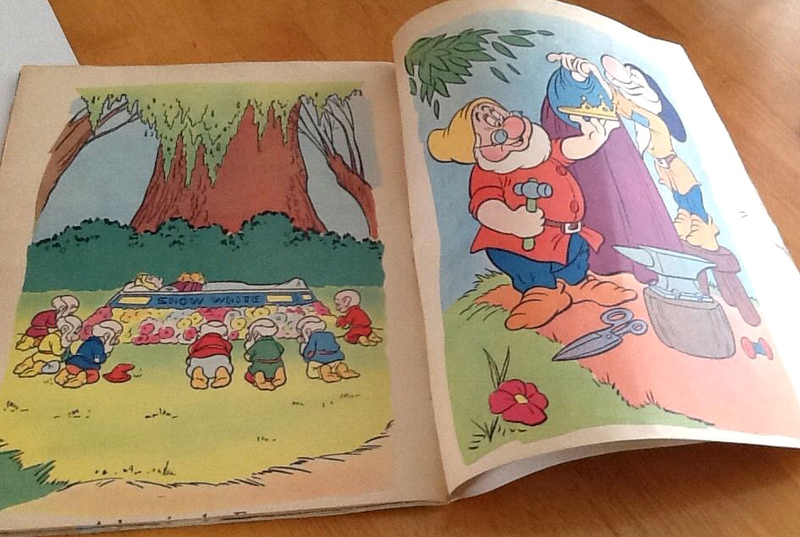 It included numerous duplicate pages, several of which are in full color. 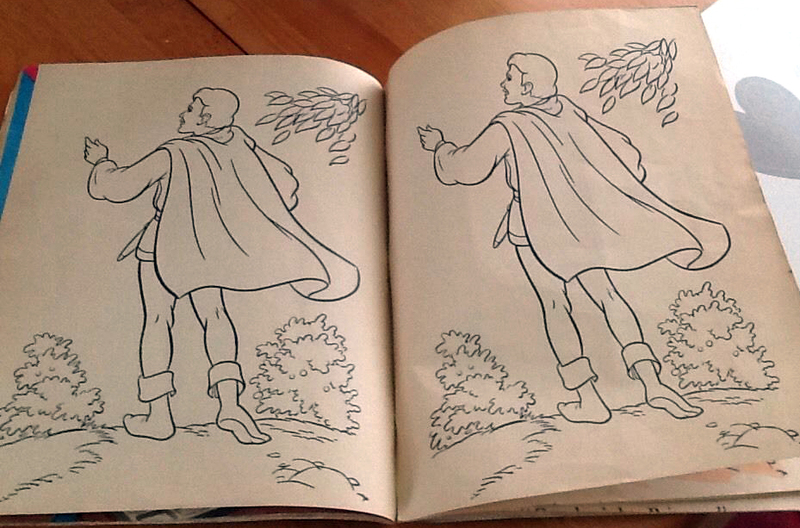 It's possible that multiple coloring books were combined; it is bound together with three large staples along the right side. Maybe this was some kind of mock-up. The title page features a blonde Snow White and reads, "Adprint London. 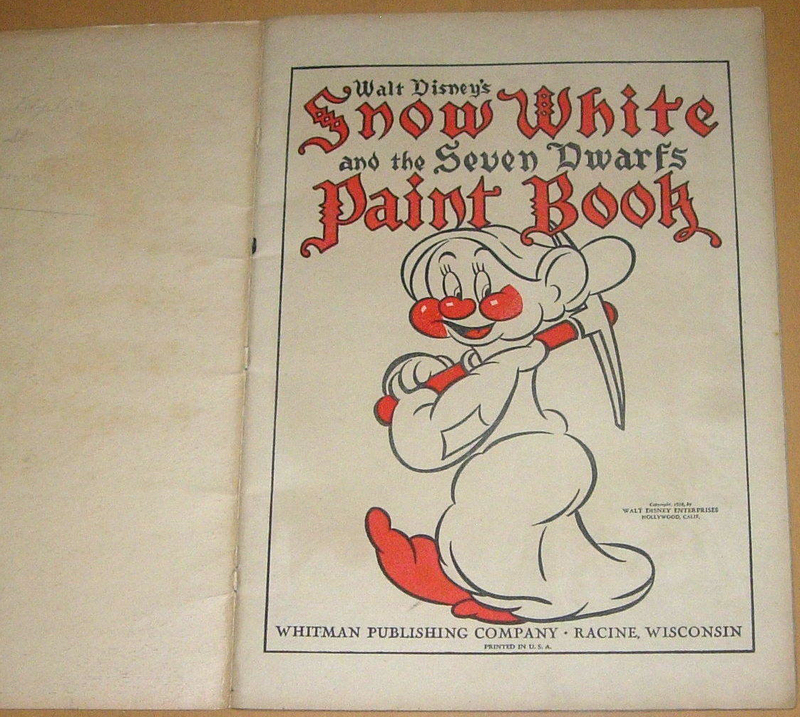 Published by arrangement with Western Printing and Lithographing Company, Racine, Wisconsin USA. 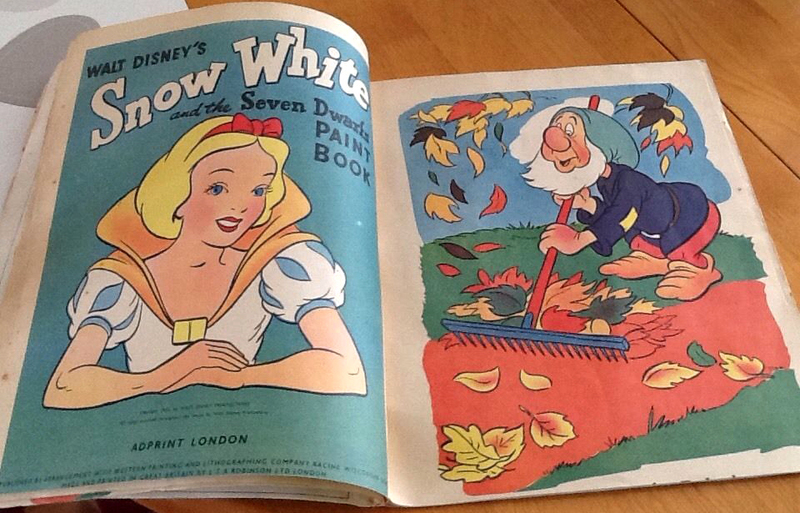 Made and printed in Great Britain by Robinson LTD. London." 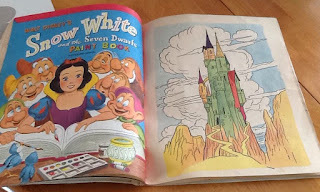 Snow White and the Seven Dwarfs Paint Book...To Color with Paints and Crayons. Produced by Whitman Publishing Company, no. 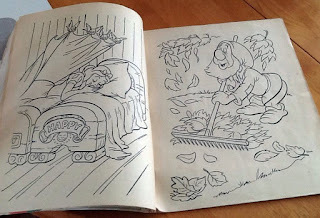 696. "Copyright 1938 by Walt Disney Enterprises." 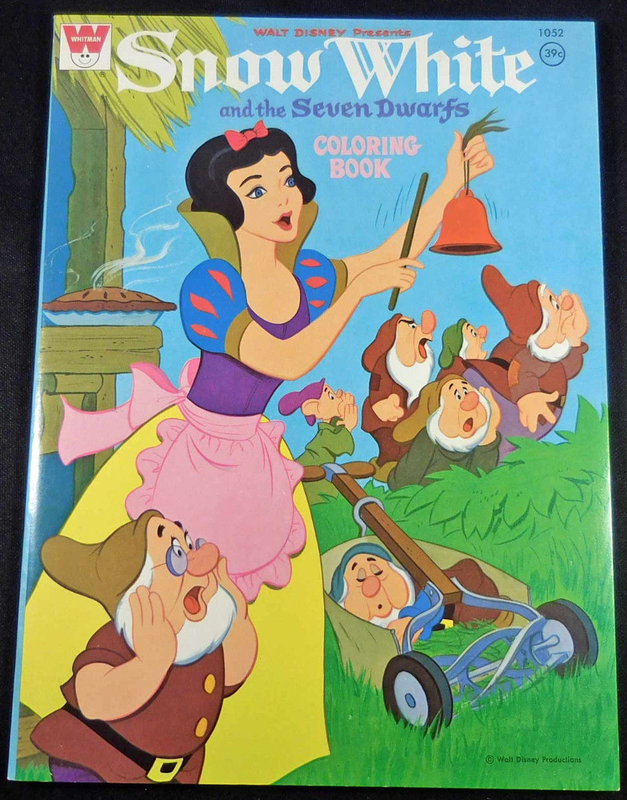 Includes 20 interior pages. 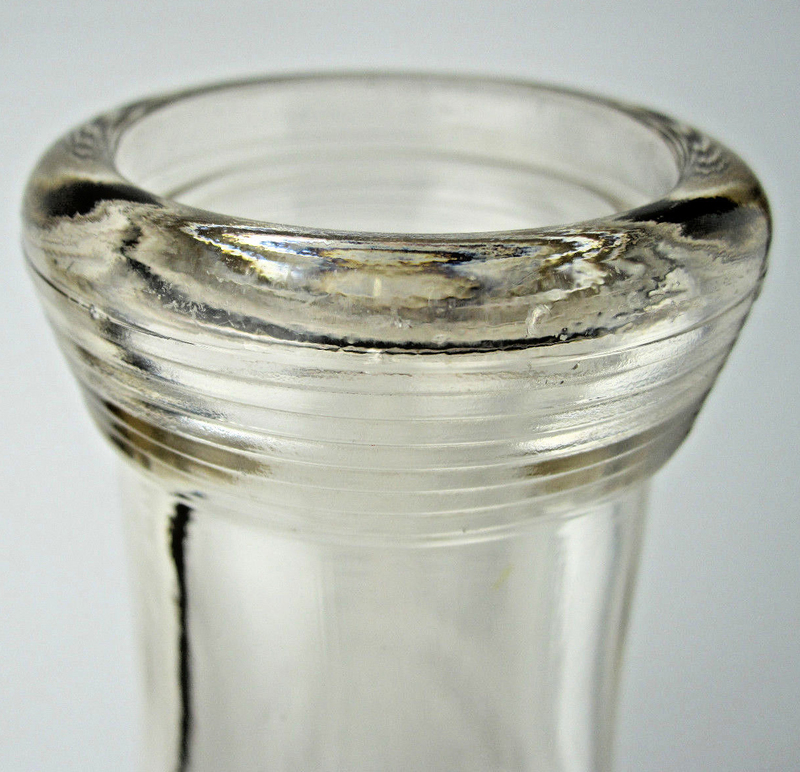 Dimensions: 15" high x 10.5" wide. 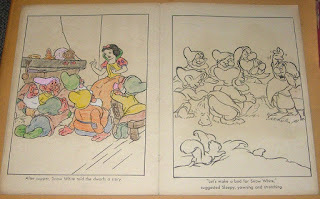 Illustrations and text copyright Walt Disney Enterprises/Whitman 1938. 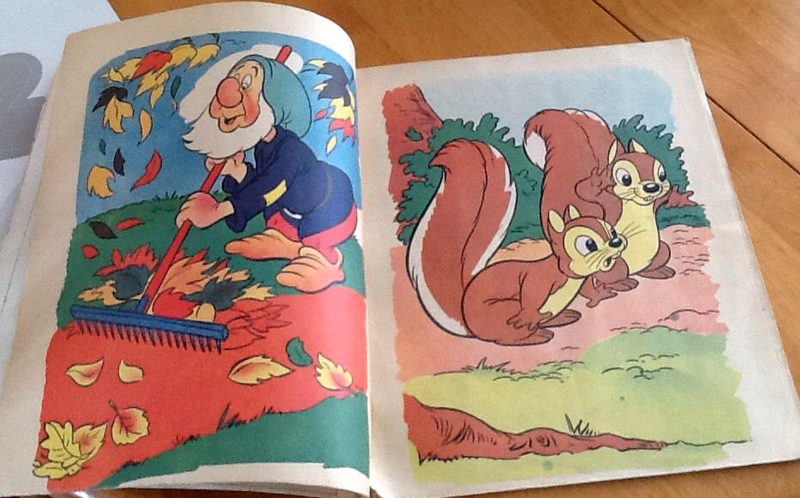 Posted here for historical documentation purposes only. Snow White Paint Book, issued by Whitman Publishing Company. No. 621. 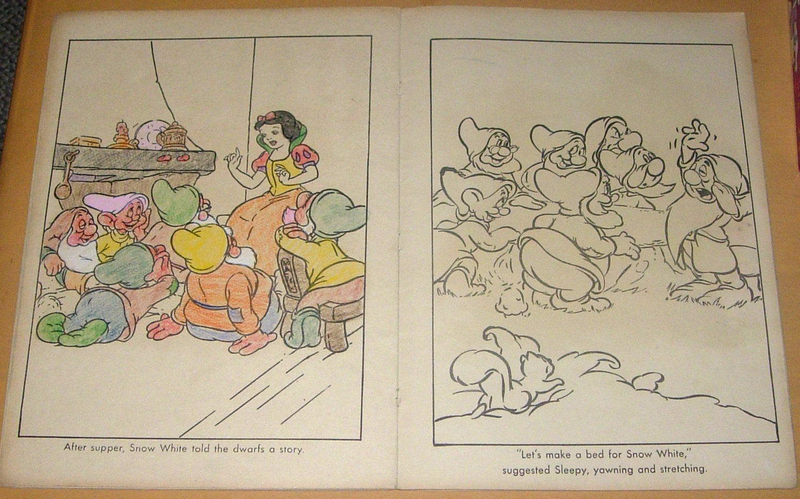 Copyright 1938 Walt Disney Enterprises. 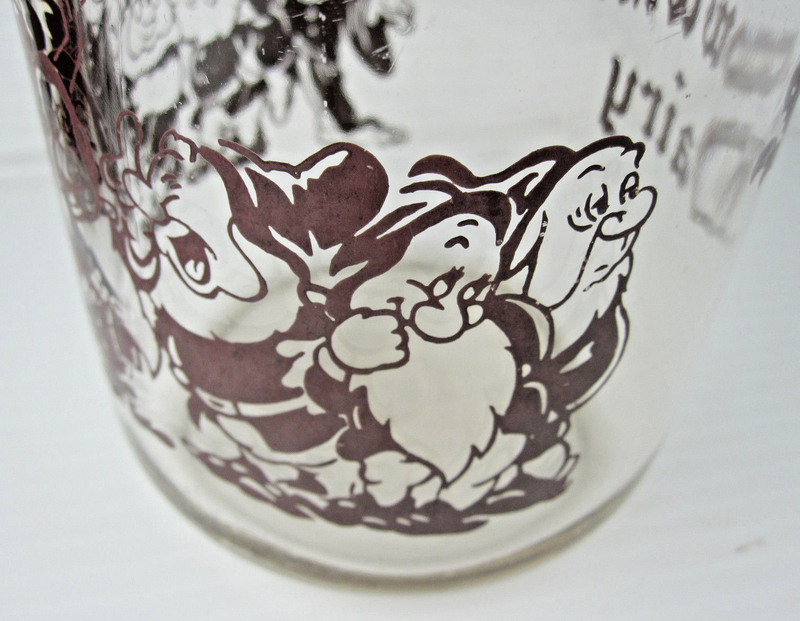 Dimensions: 7.25" tall x 10.5" wide. A total of 80 pages. 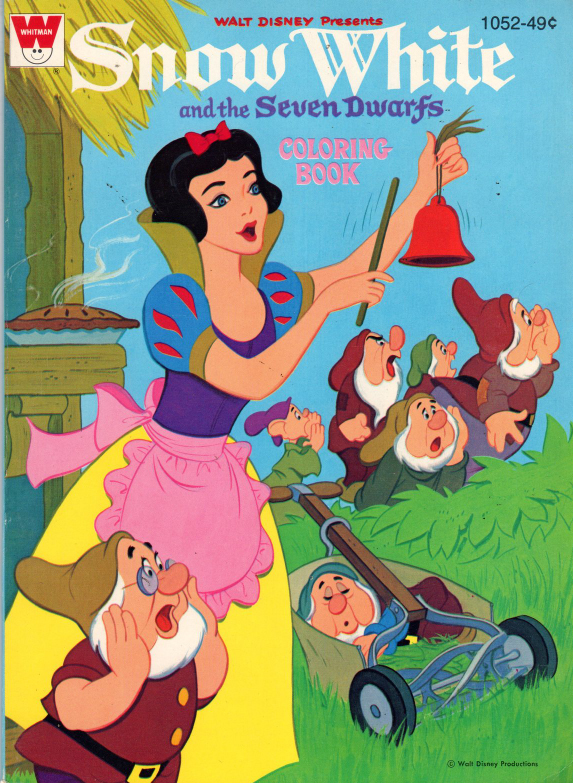 One of several early coloring books that were produced during the initial run of the motion picture. 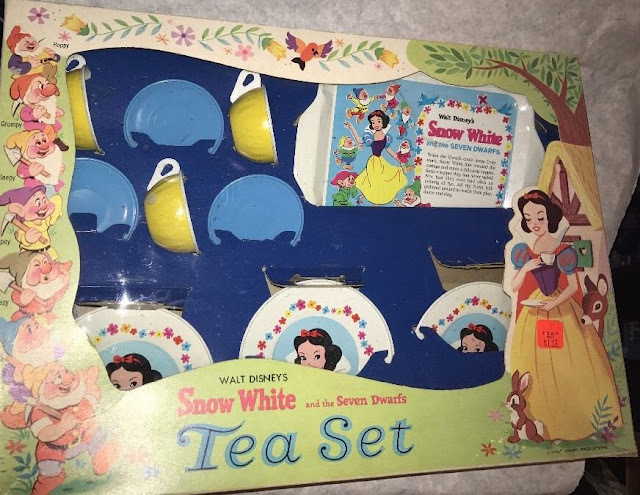 1967 Metal Tea Sets by J. Chein & Co.
J. Chein & Co. of Burlington NJ produced several Snow White metal teas sets circa 1967. The "Big Value Tea Set" included a larger serving tray (10" x 7"), three large plates, three regular plates, three large cups, and a tea pot (which was made of plastic). 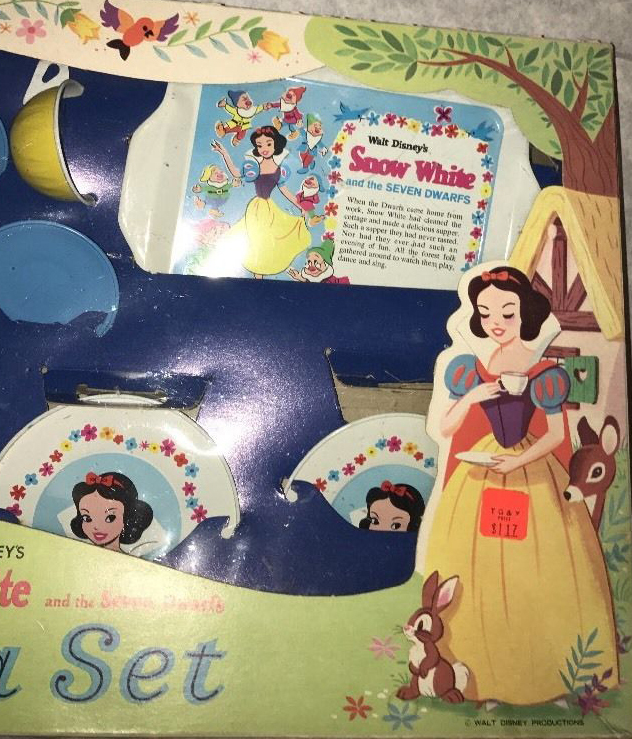 The suggested retail price was $2.49. Examples found on ebay. 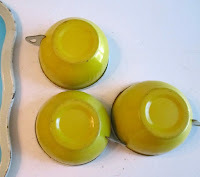 Yellow bottoms. Most cup bottoms were yellow, although some blue have been seen. 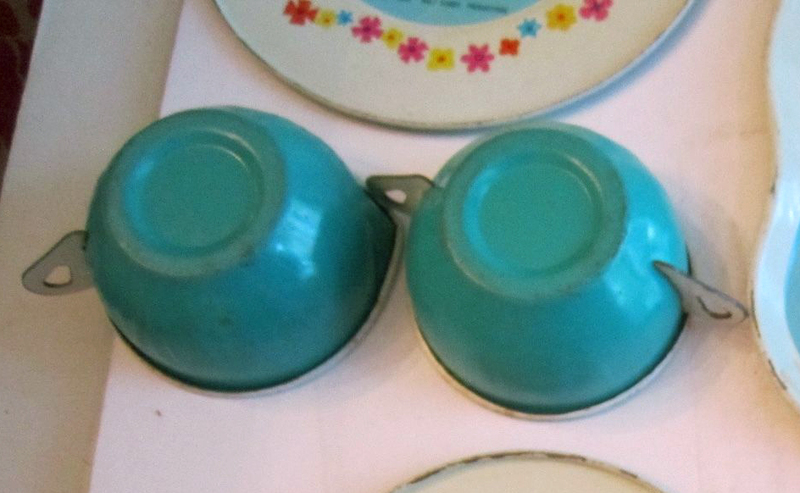 Note the two-handled creamer cup. 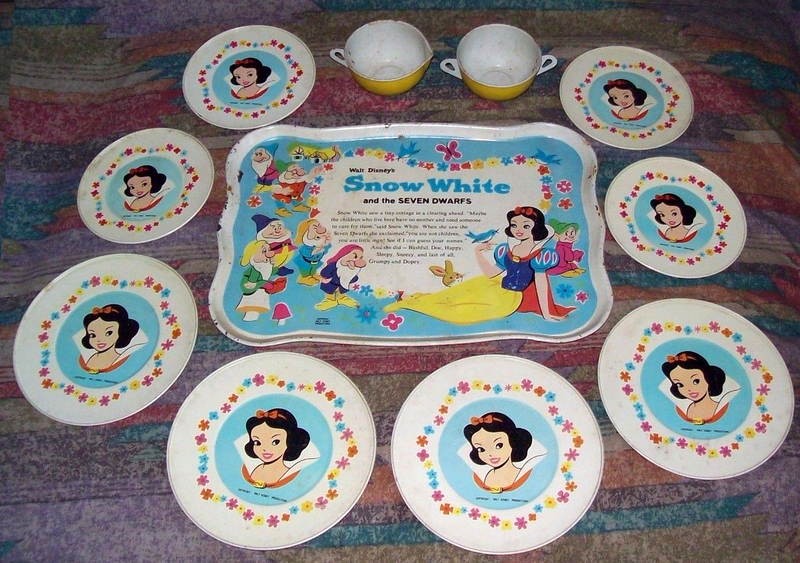 The "Fairy Tale Set" had a smaller serving tray (5" x 7"). 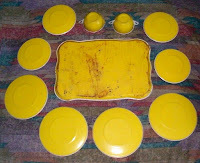 It came with three regular size plates, three blue saucers, and three yellow cups. 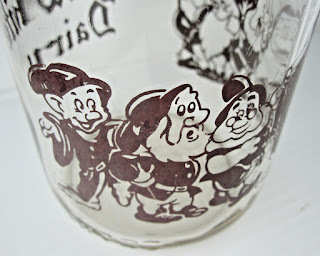 SRP $1.29. 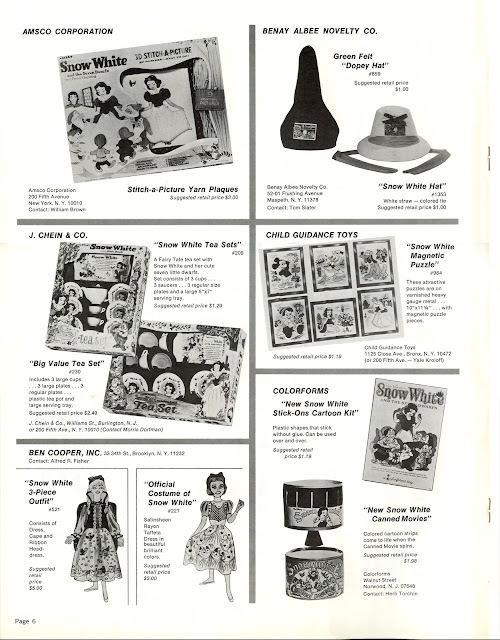 Photos of two sets are shown on page 6 of the 1967 Snow White theatrical re-release Merchandise Supplement which was included with the pressbook. 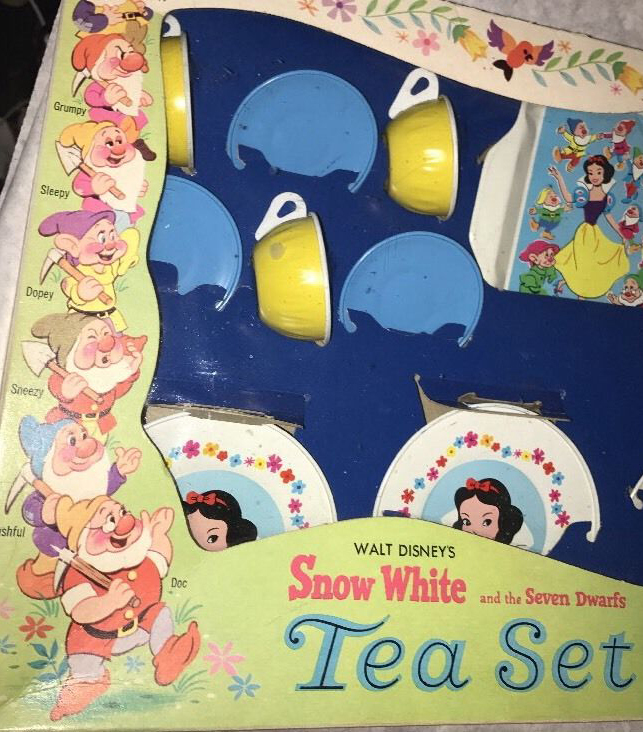 It's probable that other sets were also produced by J. Chein & Co., which may explain the blue-bottom pieces and the two-handled creamer cups. 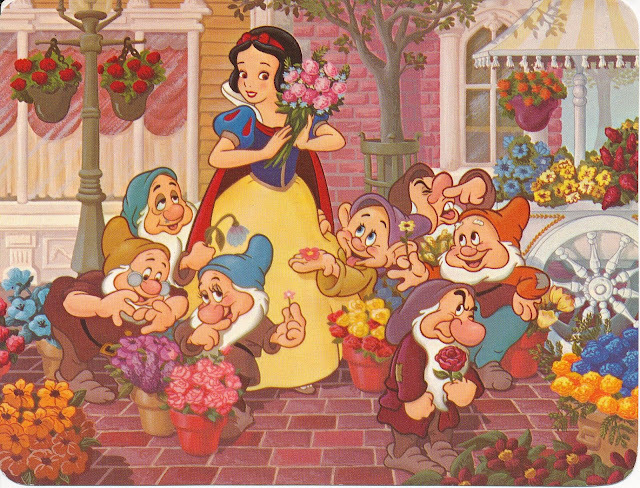 From 1979, Snow White's Fantasy Bouquet postcard. 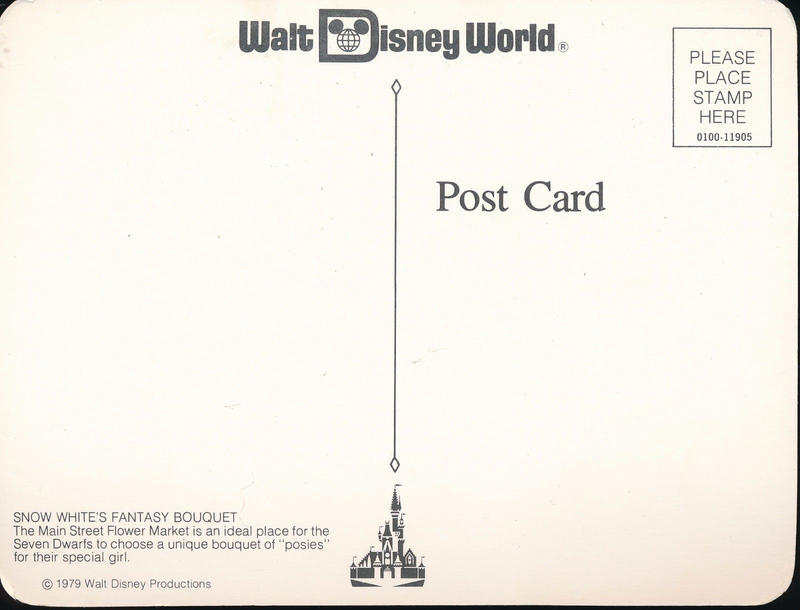 Dimensions: 5" x 7". 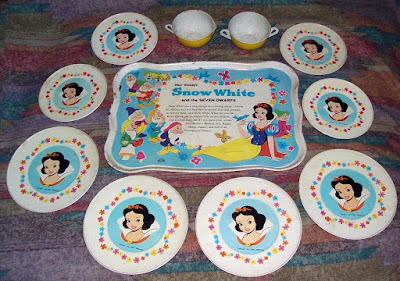 Available at both Disneyland and Walt Disney World. Snow White at the Wishing Well. 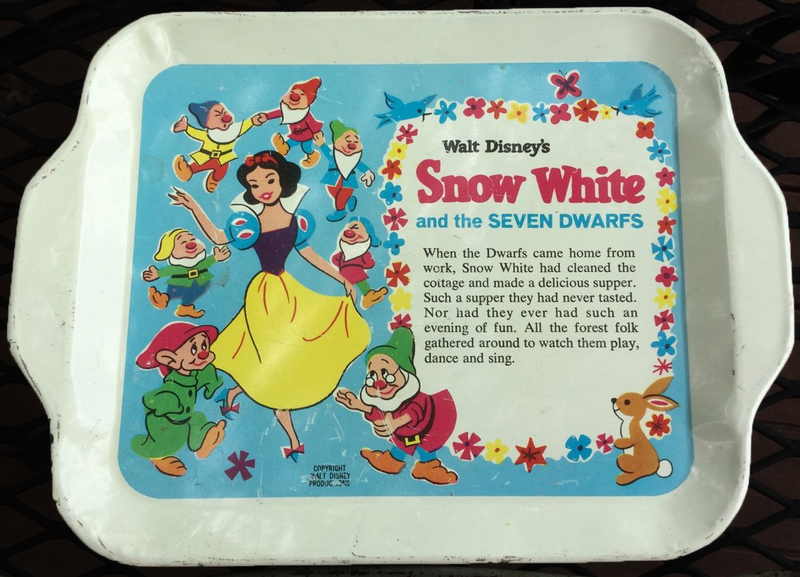 The artwork for the first card was created by Russell Schroeder, who also did a Snow White tin container and Goebel collector plate. 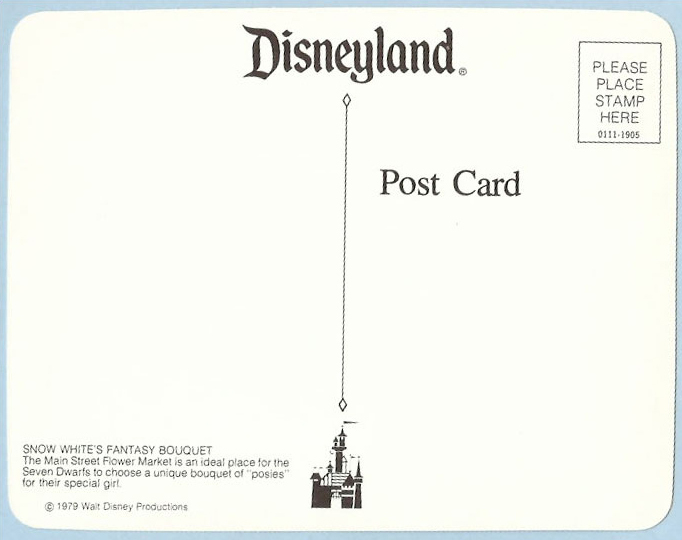 Images via the late Ken Eslick's Disneyland Postcards. Special thanks to François Monferran for additional info. 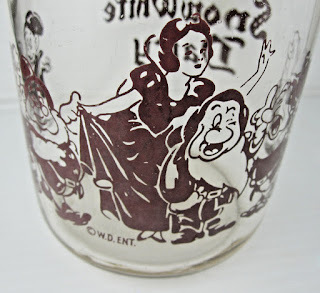 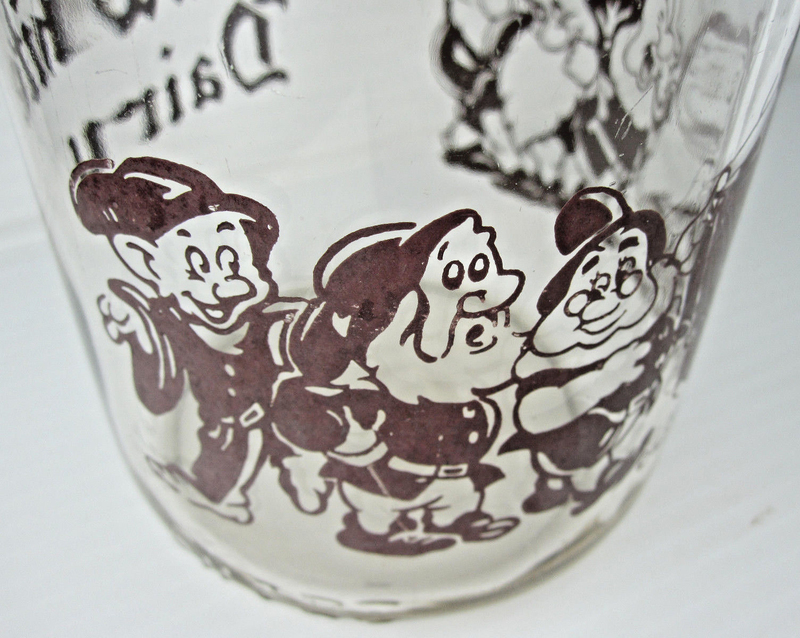 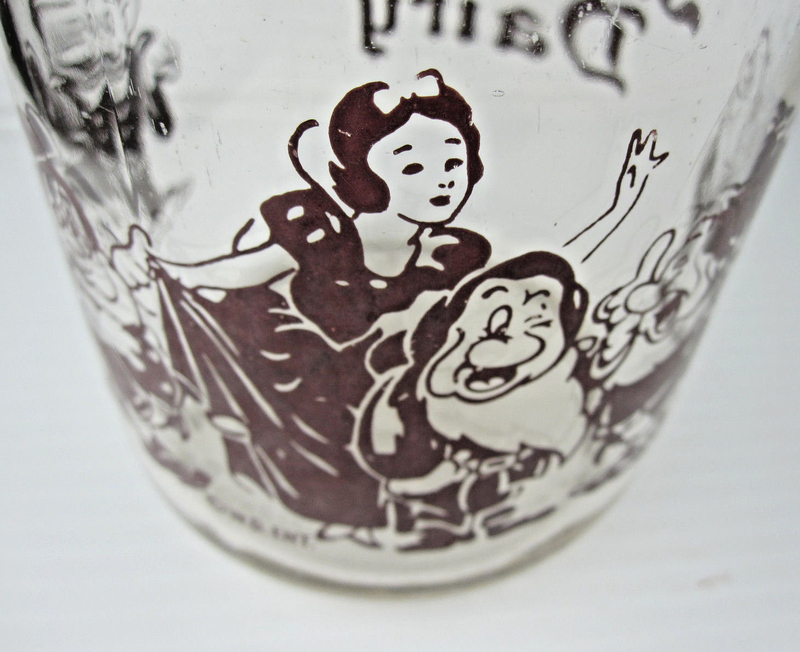 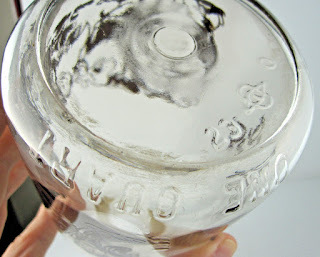 This Snow White milk bottle is a super rare find! 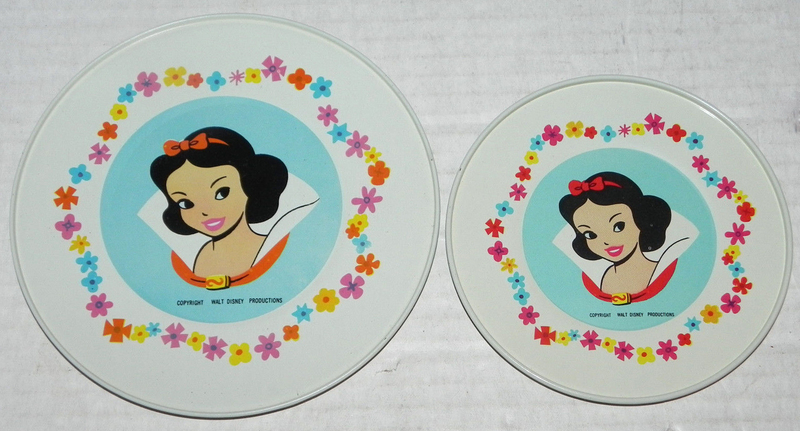 Have only seen this design online once, and it's not listed in the usual collector price guide books. 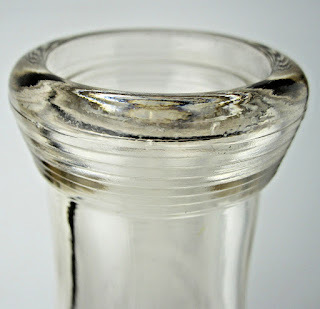 The quart container measures 9.5 inches tall. 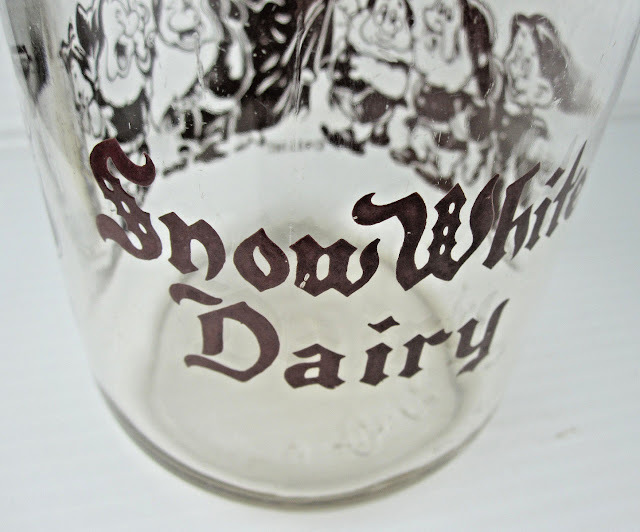 See several other Snow White milk bottles in an earlier Archive entry. 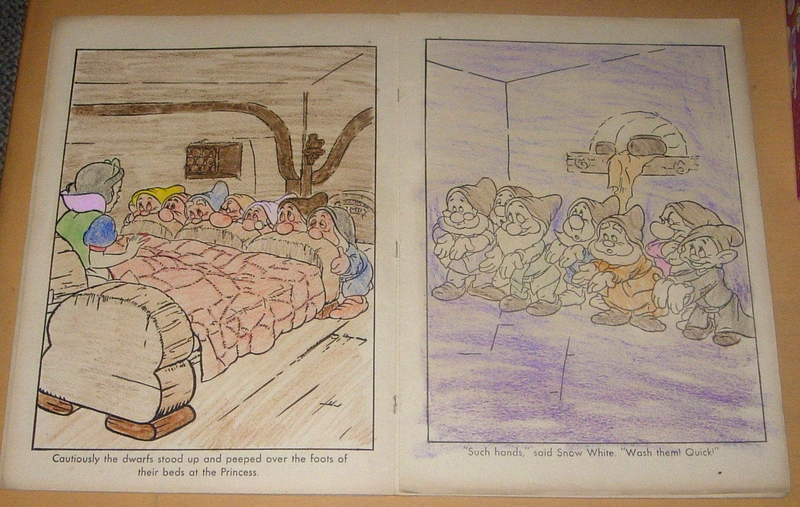 Dopey's Bean Bag Game by Parker Bros.
1939 Standard Oil "Travel Tykes Weekly"